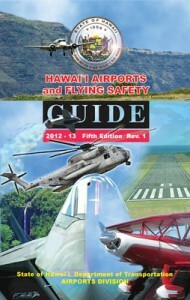 The Guide is published by the State of Hawaii, Department of Transportation Airports Division, in the interest of flight safety and the promotion of aviation in the Hawaiian Islands. In it you will find useful information, including a list of airport facilities, airfield diagrams, operating procedures, traffic patterns, weather and other pertinent data. UPDATE: Please make note of the changes that should be made for existing printed hard copies. Make pen and ink changes to p. 73 of your copy of the Guide or download and insert the Airport Safety Guide 2012-2013 Change 1 page 73. CHANGE 2. Replace pages 71 and 72 with the following update to the Honolulu Class B Airspace VFR Departure and Arrival Routes section. Download the file for the complete Hawaii Airports and Flying Safety Guide (2012 – 2013 Fifth Edition Rev 1) which incorporates Change 1 and 2. Statistics are available from the Department of Business, Economic Development and Tourism. In 1977, Runway 8R/26L or the Reef Runway was constructed as the fourth runway for Honolulu International Airport. It was built to handle the projected increase in passengers and to accommodate the physical requirements of the new jumbo jets. The 12,000 feet runway added needed capacity to the Airport and cost $88 million to construct. However, the new runway was found to destroy the bird habitats of the A’eo bird, an endangered species, and other water birds in the mudflats of Keehi Lagoon. The U.S. Navy offered two areas in Pearl Harbor for the construction of wetlands to save the birds. The Federal Aviation Administration helped with the cost of the mitigation which set a precedent for environmental mitigation in the United States. Because of the joint efforts of the State DOT and DLNR, the FAA, and U.S. Fish and Wildlife the A’eo was saved and has continued to grow in population. 2007 marks the 30 th anniversary of the Reef Runway whose construction has won national engineering achievement awards. To view and print the Portable Document Files (pdf), you need a copy of the Adobe Acrobat Reader 4.0 or higher. Download a free Reader by clicking on the Get ADOBE READER icon. This will link you to the Adobe web site, where step-by-step instructions are available.